Time to start thinking about a new calendar! Canon Creative Park has dozens of free papercraft calendars available for download. 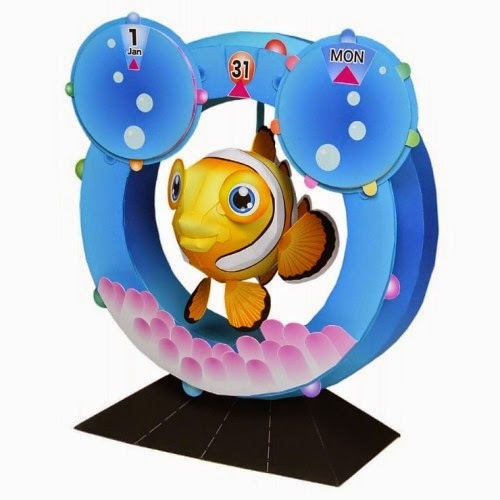 One of the most creative in their offering is this 3D tropical fish calendar. I like the fact it's a perpetual calendar and can be used for more than one year. It would make a great decoration in a Disney Finding Nemo themed kid's room. Happy New Year! Here's another fine Warhammer miniature gaming papercraft from Jim Bowen. 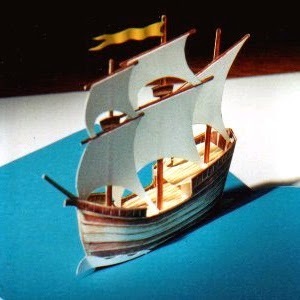 This papercraft falls into the "2.5D" category of paper models as the ship is formed from flat printouts that are glued to black foam core then stacked. According to the Warhammer 40k Wiki, the Night Scythe is "capable of combat operations in both the void and within a planet's atmosphere. 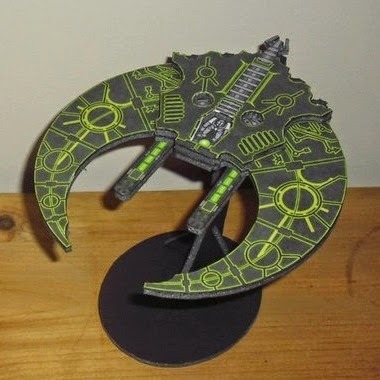 It serves the Necron forces in the interceptor, starship assault, and fighter-bomber roles." The template for the model is available here. "The design is loosely based on drawings of 16th century carracks, trading ships with high fore and aft decks. They were the forerunners of the later galleons, which were highly armed warships." 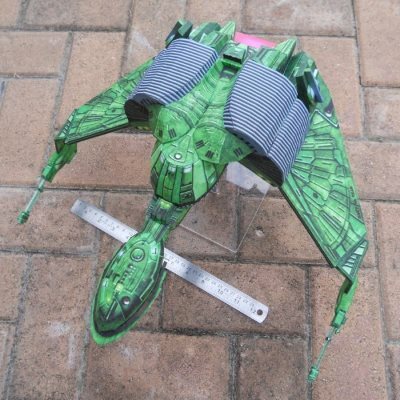 The download for the ship includes both templates and detailed instructions with diagrams. The 1991 animated film, Beauty and the Beast was a first for Disney in a couple of different ways. It was the first animated film to be nominated for an Academy Award for Best Picture. It was also Disney's first film to be adapted into a Broadway musical. These chibi (i.e. 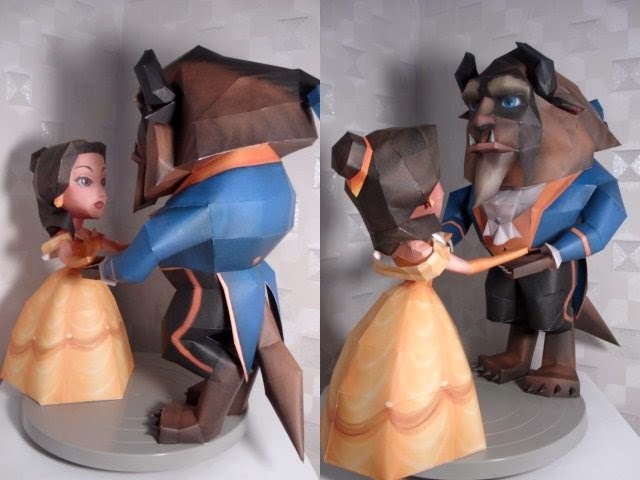 small, cute) paper models of Beauty and the Beast's namesake characters were created by PaperMike. The Pepakura PDO template for the models may be downloaded here. Pepakura Viewer and 7-Zip are required to open the template from the download. Build photos by Sinsis. 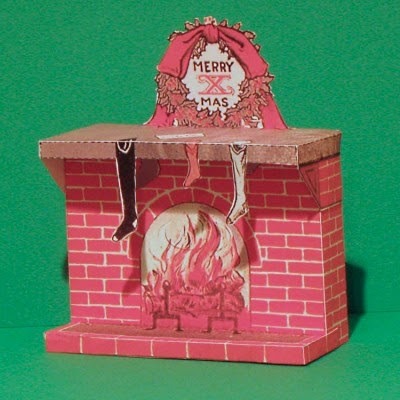 Here's a Christmas papercraft that is over 100 years old! Originally published in a 1912 issue of McCall's magazine, the piece depicts a fireplace decorated for Christmas.Stockings are hung with care. A letter is waiting for Santa on the mantel. The creator of the piece is Jeremiah Crowley, one of several artists who designed paper toys for McCall's in the early twentieth century. One of Crowley's specialties was paper toy animals. A scan of the fireplace template may be found here. In Star Wars: Episode I, Darth Maul traveled to Tatooine in a starship called The Scimitar. A more generic name for Maul's ship is the "Sith Infiltrator" as the ship was designed by Darth Tenebrous and subsequently owned by several generations of Sith. 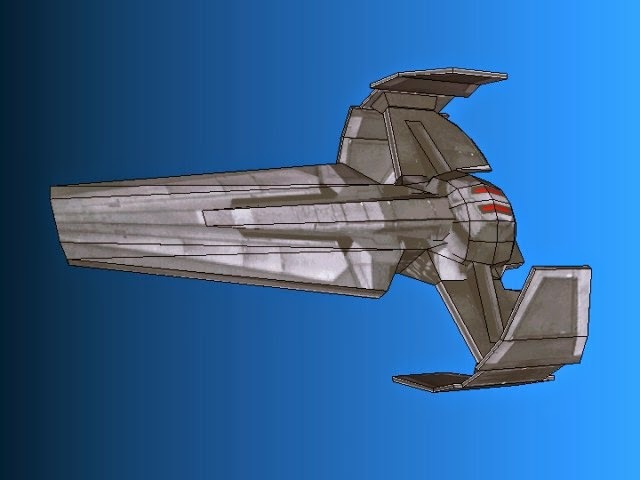 This relatively simple paper model of The Scimitar was created by a Polish Star Wars fan. The Pepakura PDO template may be downloaded here. 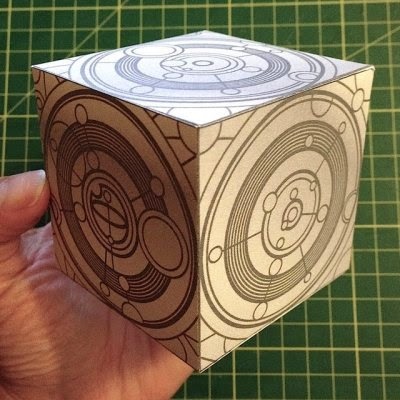 My papercrafter friend Skele-kitty has created a Doctor Who papercraft! It is a model of a siege mode TARDIS. The siege mode TARDIS made its first appearance in the eighth Doctor Who TV series when Doctor Who "collapsed" his time machine down to a small cube to protect it from an oncoming train. The PDF template for the model is available here. 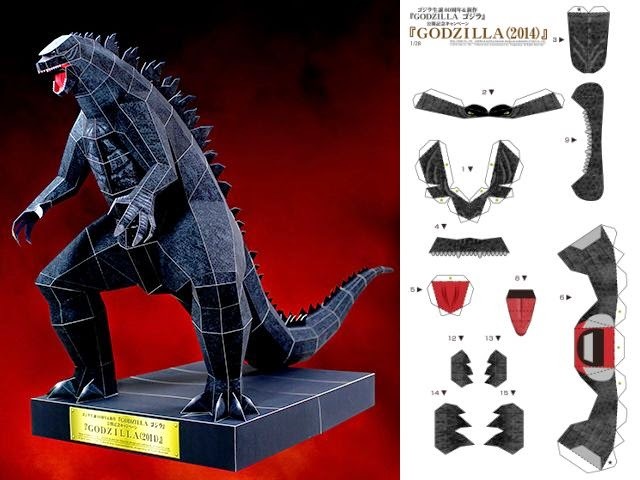 Earlier this year, in conjunction with the release of the 2014 Godzilla movie, the Epson company added a fifth model to their series of Godzilla papercraft. The new model is patterned after Godzilla's updated appearance in the movie. The template for this model can only be obtained from Epson by printing directly from the Epson website to an Epson printer. Don't own an Epson printer? Fear not. A PDF version of the A4 sized template is available here. At the end of Marvel's Guardians of the Galaxy movie, a re-sprouting baby Groot is seen dancing when no one is looking. 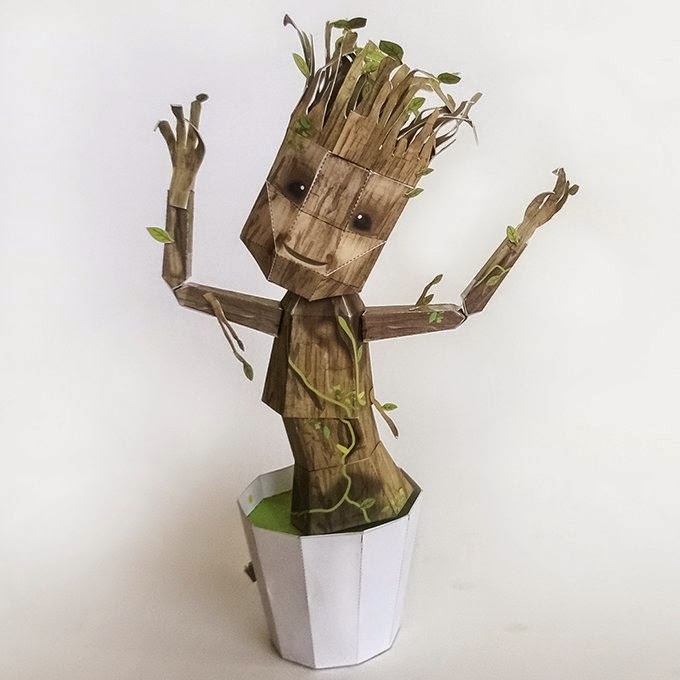 Designer Richenna King recreates the memorable scene with this baby Groot papercraft. As if the papercraft wasn't cool enough in and of itself, it is also an automata that actually dances! A PDF template, instructions, and a movie of the model in action may be found on King's Behance page. In the Marvel Comics universe, Groot is a member of a plant-based extraterrestrial race. One characteristic of the race is the ability to re-grow after being destroyed (as long as at least one sprig of their former body is recovered). Since its release in 2013, Disney's Frozen continues to grow in popularity. 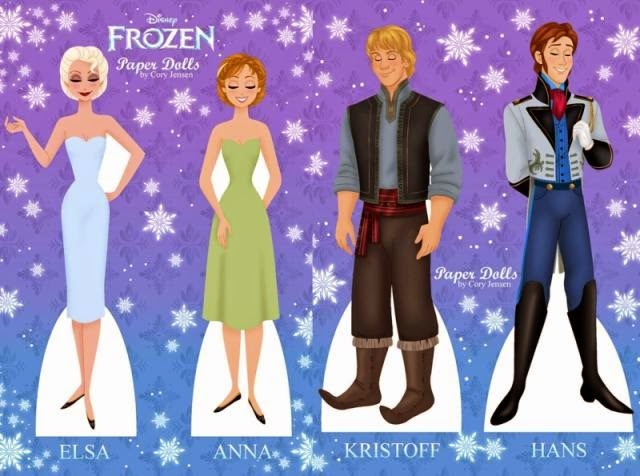 This set of paper dolls is a fan art creation by Cory Jensen. Included in the set are one change of clothes for the gents, and several changes for the ladies. Olaf the snowman is also included, but sadly he does not get any additional clothes to wear. The complete collection may be viewed on Jensen's Facebook page here. 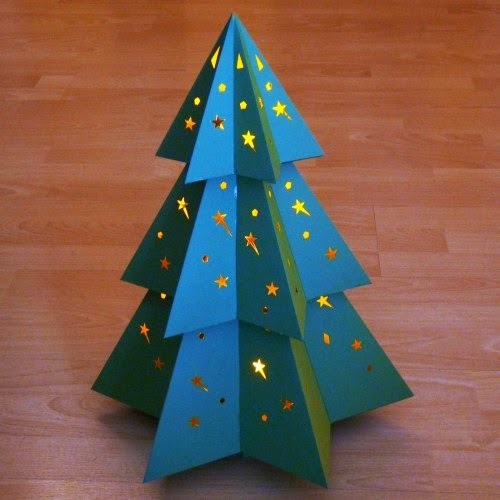 This papercraft Christmas tree is constructed with three nesting sections that allow for a battery operated tea light to be inserted at each level. The effect is lovely! The PDF template for the tree may be downloaded at the bottom of the page here. Also available on the same page are several different styles of Christmas trees, as well as a three dimensional papercraft star to go on top of the tannenbaums! This weekend I was in the mood to build an architecture paper model, but didn't want to spend a lot of time. 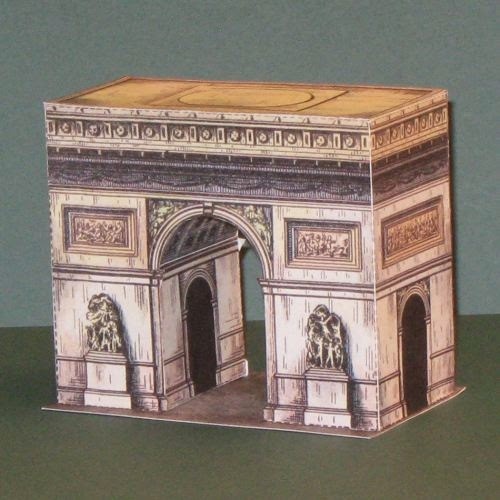 This antique papercraft Arc de Triomphe filled the bill. Counting printing, cutting and gluing, it took me about 20 minutes to complete. The template for this model originally appeared in the Danish language magazine, Illustreret Familie-Journal, founded in 1877 by Carl Aller. Numerous scans of Familie-Journal model templates may be found at the Agence Eureka blog. The Arc de Triomphe template is located here on Agence Eureka's Flickr page. 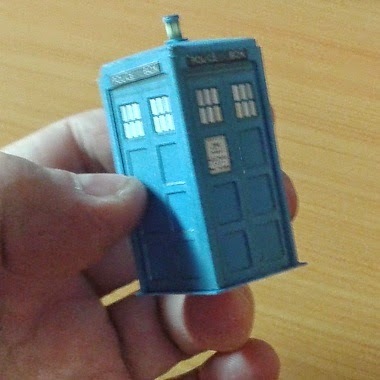 There are plenty of paper models around of Doctor Who's TARDIS, but none quite as small as this. Papercraft designer Dave Winfield proves once again he is a master at creating detailed models whose templates fit on a single sheet of paper. The PDF template for the TARDIS may be found here. For the uninitiated, the TARDIS is a time machine that appears to be a British police call box. 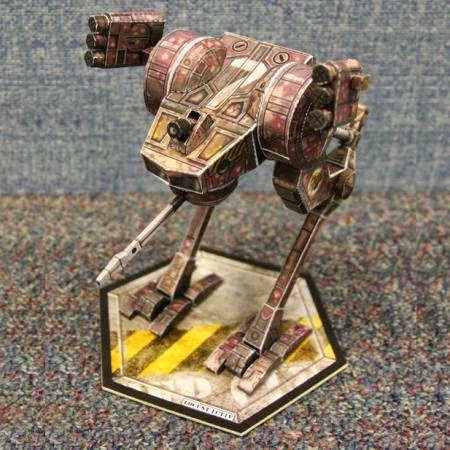 This mech papercraft is based on the Locust light battlemech from the tabletop game Battletech. The Battletech wiki describes the Locust as "designed exclusively for reconn-aissance and quick strike missions, using its phenomenal speed to outrun most enemies." DeviantART member Scarecrovv is the designer of the model. A template download, complete with instructions and alternate textures, is available here. The finished model stand about 6" (15 cm) tall. 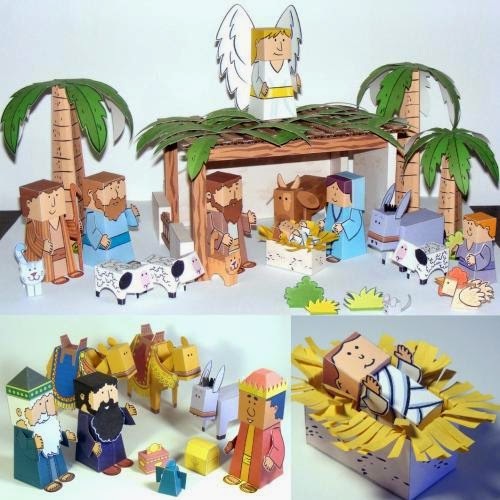 I like the cartoonish simplicity of this papercraft nativity scene. The fact that two cats and a mouse are included with the animals make me smile. I also am impressed by the shear number of pieces the set contains. The templates for the scene may be downloaded individually, in groups (such as shepherds and wise men), or as an all-in-one 50mb RAR file. Kudos to Didier at My Little House blog for his labor of love in creating this set. 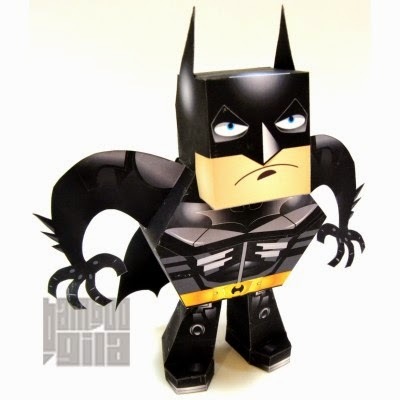 This Batman paper toy was created by Bamboogila in 2012 to celebrate the release of The Dark Knight Rises movie. Don't know how I missed this one the first time around. :) I am looking forward to a new wave of Batman papercraft when the Batman vs. Superman movie is released in 2016. 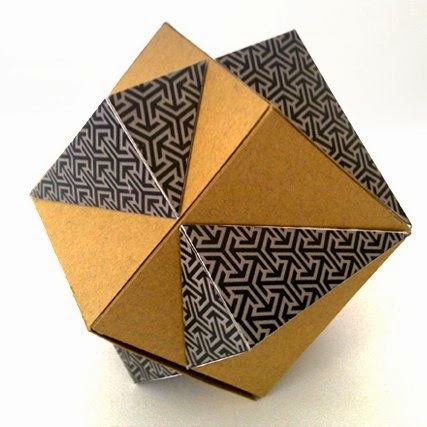 The PDF template for this paper toy may be found here. If you are looking for a unique gift box for the holiday season, look no further! This unusual box has the appearance of two cubes that have been fused together. It is just the right size for candy or a small present. The PDF template for the box was created by DeviantART member ikarusmedia and may be downloaded here. Included in the download are easy-to-follow photo instructions. The first Advent calendars were used by German Lutherans in the 19th century as a way to anticipate the days leading up to Christmas. Advent calendars come in many forms. 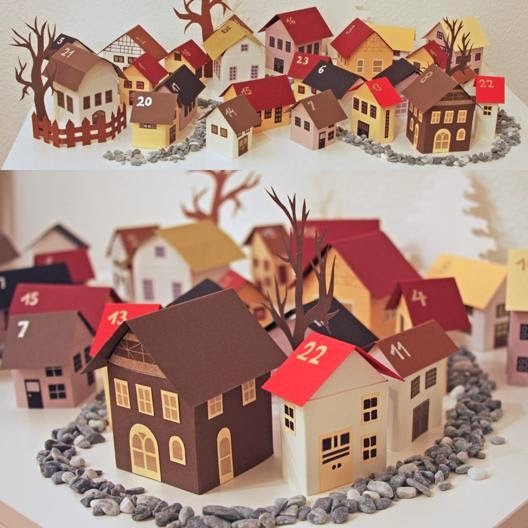 This particular calendar takes the form of a winter village. At the beginning of the Christmas season, treats are placed in each of the houses. Then once per day, according to the date on the roof, a house is opened to reveal the prize inside. 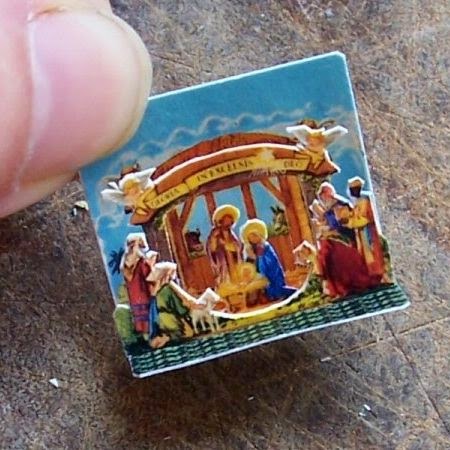 Photo instructions on how to make your own custom Advent village may be found here. 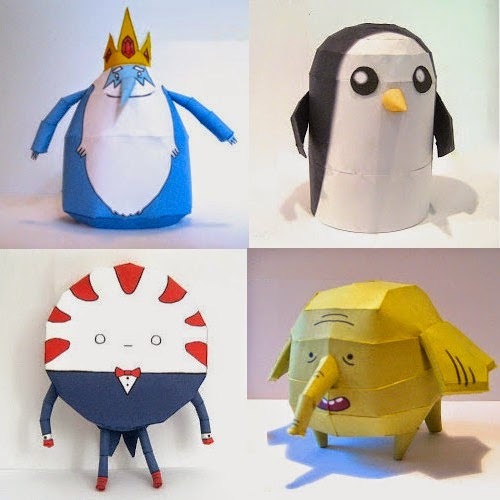 The Adventure Time papercraft blog got off to a flying start in 2013, but alas the effort lasted only a scant two months. Still, a collection of awesome paper models continue to be available for download at the site. Pictured is a sampling of my favorites out of the ten different models to be found there. Here's fingers crossed the blog comes to life again someday. The Adventure Time animated television series is currently in its sixth season. 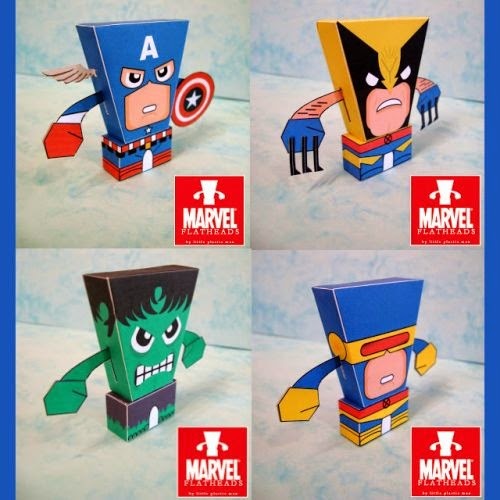 The Little Plastic Men blog has an ongoing series of paper toys called "FlatHeads". Series 3 just so happens to be Marvel heroes! There are five toys included in the series: Captain America, Wolverine, Hulk, Cyclops, and Namor (not pictured). The single page templates for the toys may be downloaded here. Haku the dragon is one of my favorite characters from Studio Ghibli's animated movie, Spirited Away. 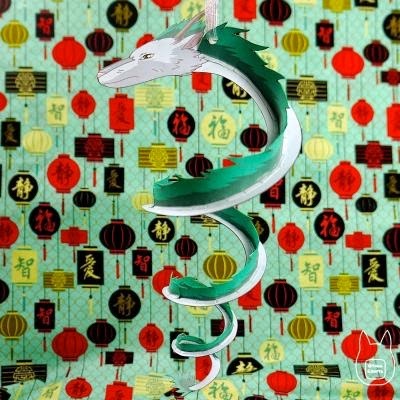 Now, thanks to Otaku Craft, you can build your own Haku ornament to hang on your Christmas tree! The PDF template for the papercraft dragon may be downloaded here. In the movie, Haku is a river spirit that at will can take the shape of either a flying dragon or a young human male. The original Dodge Power Wagons produced in the late 1940's were based on military trucks built by Dodge during World War II. The Power Wagon has the distinction of being the first 4x4 truck produced for civilian use. 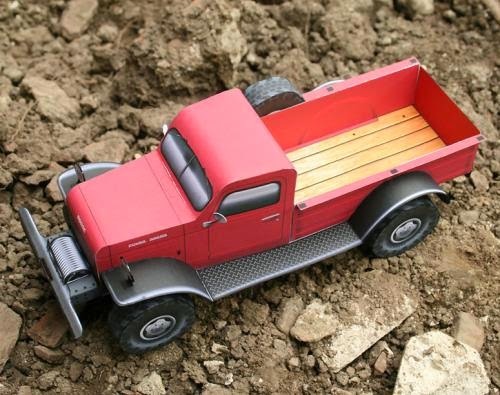 The PDF template for this papercraft Power Wagon may be downloaded here. Model design by Paper Cruiser.